With the retirement of Dr. Perry in June 2016, these pages will be minimally updated. 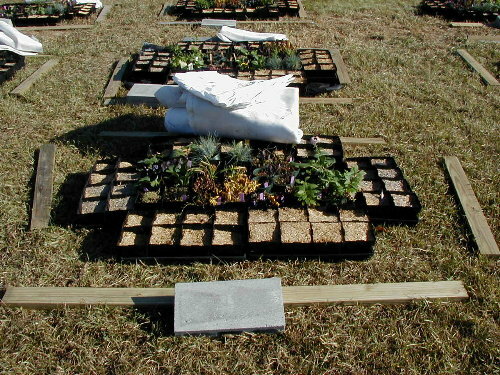 Except for field perennial trials, and annuals at Waterfront Park, other research has ended. The zone 4 Milton (VT) site is one of 17 selected across the U.S. to trial new ornamental grasses, under the direction of Dr. Mary Meyer of the University of Minnesota. These were planted in summer 2012 and are being evaluated the following 3 years. Initially, with 4 replicates randomized of each cultivar, will be 5 selections of bluestem (Schizachyrium) and 17 of switchgrass (Panicum). (results and updates on wordpress blog at grasstrials.com). Over 100 new cultivars are being evaluated in trials in USDA zone 4b for performance, flower time and color, hardiness, pest problems, and potential for future studies or use in the region. In 2008, field trials were begun on coralbells (Heuchera) field hardiness,(updated 6/13), with final results in 2014. In 2011, field trials were begun on coneflower (Echinacea) field hardiness (updated 7/13). 2014 winter survival results (7/14). Results through 2015.
ongoing: Annuals are also being trialed at the Waterfront Park in an official All America Selections Flower Display Garden which also include specialty annuals courtesy of DS Cole Growers and Pleasant View Gardens in New Hampshire. 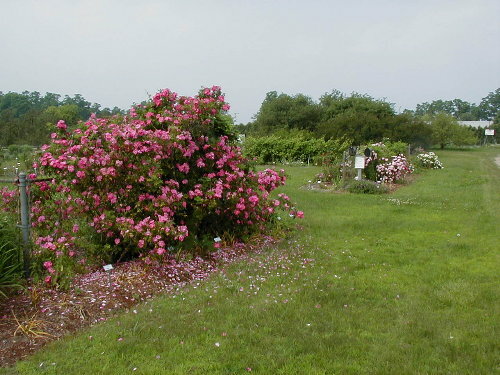 Over 5 dozen cultivars of shrub roses (list and characters), emphasizing new series such as the Parkland, Meidiland, Explorer and David Austin ones, were evaluated among these sites and in cooperation with the University of Maine (Dr. Lois Stack) for hardiness, performance and disease resistance (rose ratings (updated 9.05) article on top 15 rated to date). Emphasis in the past of the hundreds trialled was on perennial geraniums (spring observations) (2001-2002 observations) (photo 7/01), monarda including new Dutch cultivars, Tiarella, Heuchera, Pulmonaria, and potentially hardy epimediums. Deacclimation: In 2008-09 a study began to examine various temperature regimes of deacclimation during midwinter (January) for Sedum 'Neon' and Salvia 'Rhapsody in Blue'. Treatments included holding at 34F, one week or two weeks at 55F, one week of cycling between 34F and 55F, and one week at 40F. In 2009-2010 the same deacclimation study was done with two additional perennials Achillea 'Apricot Delight' and Leucanthemum 'Becky'. Due to plants potted late in fall with insufficient time to establish, they overwintered poorly so results were not reliable. 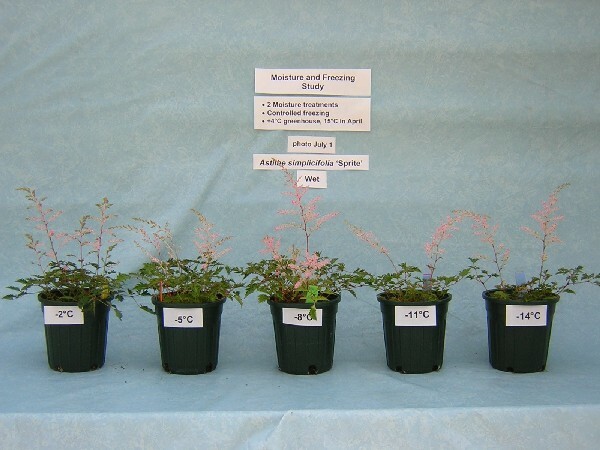 In 2010-11 a similar study was done with 'Becky' and Tiarella 'Delaware', with exposure to various numbers of days (1,3,5,7) at 65F during the day, then back to 40F at night, prior to freezing to examine the effect of deacclimation on hardiness. Few 'Becky' survived below 18F, which most 'Delaware' survived to the lowest temperatures of 8F, regardless of pretreatment. 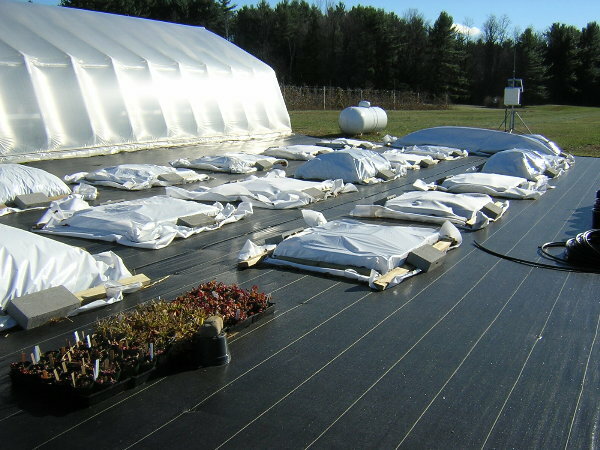 Several dozen perennials over several years are being frozen in controlled chest freezers to determine root killing temperatures; effects of cold intensity, duration, cycling, and rate of drop. 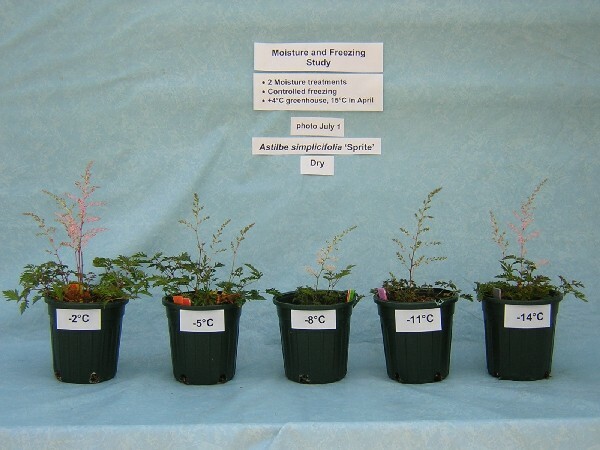 These included heathers (Calluna) during 2001 and 2002.. Other freezing studies examined various factors affecting hardiness such as temperature cycling and rates of drop, and the effect on hardiness of dianthus, foamflower and perennial geranium. In part, these were from the M.S. thesis research of Cheryl Bruce (see abstract and slide show), Andrea Luchini (2003 results , summary, thesis abstract, and slide show), and Sarah Kingsley Richards (Dec. 2011 article and Sept. 2015 article in Journal of Environmental Horticulture | thesis abstract | presentation). Results of these, and studies of previous grad students, are summarized in leaflet COH31. In 2009-2010 studies were begun on the hardiness of Heuchera (coralbells) cultivars, particularly villosa hybrids (funding courtesy of New Hampshire Plant Endowment). Plants were frozen to the five usual freezer temperatures (-2,-5,-8,-11,-14C) on two dates in January and March. Cultivars under study included: (links to result photos) 'Caramel', 'Mocha', 'Blackout', 'Frosted Violet', and 'Tiramisu. (2009-2010 results). In 2010-11 (results) five additional cultivars were frozen similarly, with few differences among temperatures from an early January freezing, but with significant differences from a late February freezing (plant survival decreasing significantly at 18F and below). 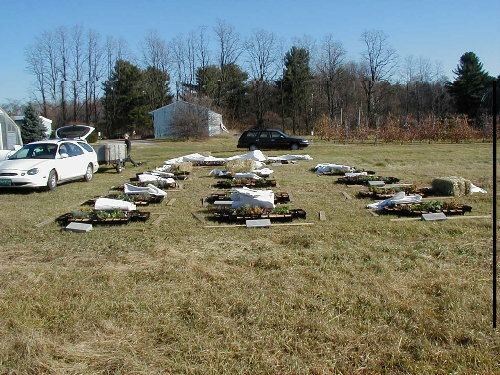 2012: In Fall 2011-Winter 2012, Delaware Tiarella, Kahori Dianthus, and Bronze Wave Heuchera were acclimated for various times (none, 1, 2 or 4 weeks) at 40F after a period of temperatures 50F and above, then frozen to various temperatures to determine hardiness. Tiarella and Heuchera also were subjected to two or no cycles below freezing (-7 to -9C and 0 to -2C) prior to controlled freezing. Studies will be done on controlled freezing of 3 coneflower cultivars (White Swan, Pica Bella, Pixie Meadowbrite) both in January and late February, similar to recent studies with coralbells. Controlled freezing also will be done on 4 other perennial cultivars in January (Raspberry Wine monarda, Raspbery Regal coralbells, Sherwood Purple phlox, Global Warming chrysanthemum). 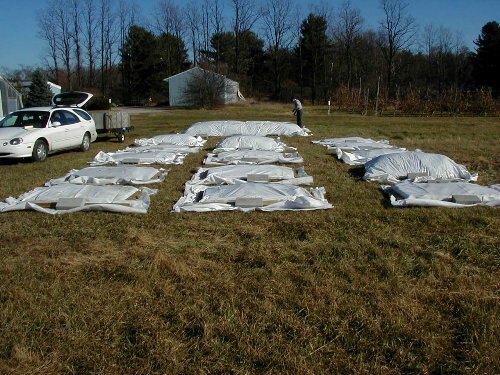 New overwintering fleece cover in various layers on 20 cultivars, including a sandwich of straw between white poly layers, and one or two layers of fleece (thick felt material) with and without a white poly covering (funding by New England Greenhouse Conference; plant donations courtesy of Creek Hill Nursery, PA), compared with same cultivars under controlled freezing. Performed 2003--04, 2004-05. Results forthcoming. Three cultivars (Hemerocallis Stella d'Oro, Geranium 'Max Frei', Dianthus 'Arctic Fire') were potted in 12 combinations of media and fertility to observe effects on growth after one season. Media include commercial peat-lite, local organic, and German peat-lite products. Fertility include organic liquid, standard liquid, and new color-coded Osmocote products. In summer 2009, six perennials (Ice Dance, Becky, Bevans geranium, Rhapsody in Blue salvia, Brandywine, and Caramel coralbells ) were grown with three fertilizers (2 rates of a 4-3-2 organic poultry product and Nutricoat) and two media (ProMix BX as a control with a new cow manure based product from Vermont Organics Reclamation also with coffee wastes and perlite 4:1:1 v:v:v) to determine possibility of the latter medium for production. New cultivars (15) of beebalm were established in 1998 (H) for evaluation for genetic resistance to powdery mildew in a randomized complete block design. 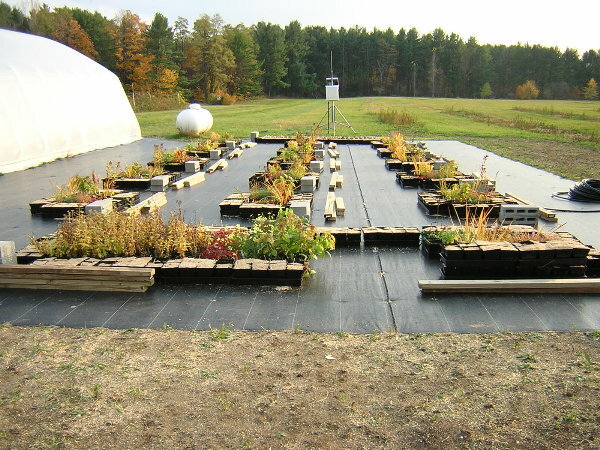 Plants were evaluated for drought, weed and cold stress early 2000, then potted for subsequent mildew studies at the UVM greenhouse (U). 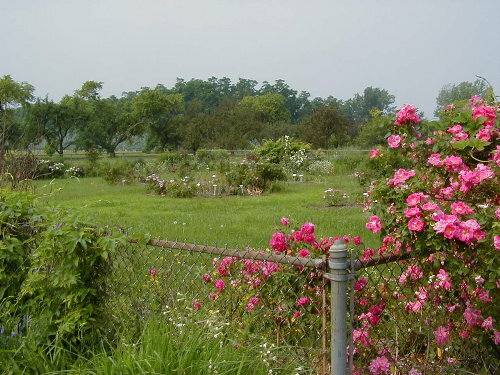 Due to poor growth in pots, plants were put into field studies in Milton in 2003. Plants will be dug, divided, and potted this year for continued trials in pots. During 2000 and 2001, 5 organic controls were tested on Snow White bee balm (see article below) in containers (U). 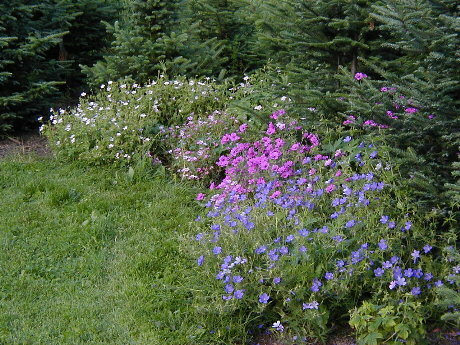 In 2003 a study with Phlox pan. Mt Fuji was established to look at the effect of salt and milk solutions on mildew, as have proved effective on grapes and vegetable crops. Beginning in 2003, 24 new cultivars of garden phlox will be compared in a randomized complete block design for resistance to powdery mildew in field studies in Milton. (8/03 photo). No results were obtained this first year, due to poor mildew pressure, with the study to be repeated in 2004. About 15 cultivars of Aster novae-angliae were established for evaluation for genetic resistance to rust in a randomized complete block design in the field. After two years of defoliation due to lacebugs, plants were potted and moved to the UVM greenhouse. With poor growth in pots, plants of the 12 cultivars were subsequently planted in randomized complete block field studies in Milton in 2003 with data obtained late in the a season (2003 rust article). Data were not available since due to minimal rust and subsequent browsing by deer and groundhogs. Okay, they're not herbaceous perennials, but are effective in our climate used in combination with them, and a key shrub in Vermont. This evaluation over many years of over 230 varieties emphasizes bloom and disease resistance, with many photos and a table of blight resistance observations. At 3 sites in the Champlain Valley (USDA zones 4a, 4b and 5b), at least 2 dozen cultivars of ornamental grasses were evaluated over a five year period for winter hardiness, as well as other landscape features. Many are recent introductions to the U.S. from Germany including new ones this year. Results were included with those from an extensive collaborative national effort. Appreciation is expressed to New England Grows; New England Greenhouse Conference; Vermont Nursery and Landscape Assn. 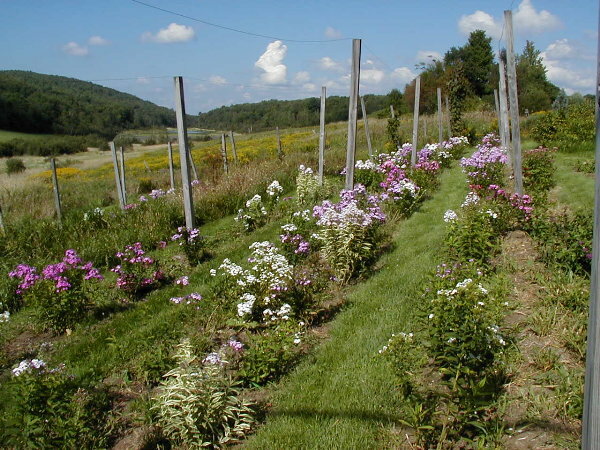 ; New Hampshire Horticulture Endowment; Perennial Plant Association; Greenleaf, Sunny Border, North Creek and Dunvegan nurseries; UVM Extension; VT Agr. Experiment Station. Thanks to Burlington Parks and Recreation for assistance and making possible the Waterfront Park display beds.